A blog reader called Graham wrote to me to ask advice about how to get a decent high-powered flame for cooking Chinese food in a UK kitchen. “I am staying in a modern flat in Beijing over the summer and one of the great things is being able to cook on a high-powered burner. I can actually get some smoking happening quickly, and attempt to flash-fry things. “I’m sure this is nothing compared to restaurant kitchen stoves, but it would be great to cook like this back in England, and it makes me realise how puny my UK cooker is. I guess it might be possible to buy Chinese stoves in England, but even then is out domestic gas supply suited to them? Thanks Graham! Frankly, I’d like some advice on this too! At home I have a supposed ‘wok burner’ on my gas cooker, but it’s not really satisfactory. At the moment I’m considering more high-powered models, and the possibility of an induction cooker, which I saw being used in the kitchen of Neil Perry’s Spice Temple in Sydney. Not traditional, but extremely hot, fast and effective. Ah the ever lasting burner question. I’m also still looking for a solution I emailed with these guys, any one who knows them? 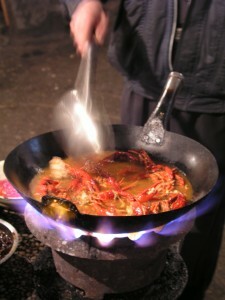 I know some people who bought there wok stove here: http://www.indiajoze.com/equipment.html They ship also to Europe. For about 120 – 150 US Dollar + shipping cost. In germany (where I am from) a good seller is : http://wok-world.de/. Look for Burner 41 for 134.50 Euro. I do not know if they ship to Great Britan, just ask them. Friendly staff & good service. So by now it is not a problem any longer to get a decent burner (one who cranks out up to 100.000 BTU) for a really resonable price. There was an excellent little piece on this subject in Saveur in a recent article (from within the past year?) I think it was in the context of an interview with Grace Young. It essentially offers a “compensatory” (“if you can’t beat ’em, join ’em”) model for stir-frying in a modern Western apt kitchen, the most important idea being: not to overcrowd the wok too rapidly with more and yet more ingredients but to let the temperature rise back up as high as the flame will allow after each addition before piling yet more on. This certainly isn’t the same as working with a high-powered flame but it “is” extremely good discipline since it forces the cook to watch closely and have a sense of what is happening to the food at all times. Thanks Fuchsia for posing the question on my behalf, and to everyone for their answers. I’ll take a good look at all those links when I get more than a few minutes. To be honest, I was surprised myself at the difference between the burners here and at home. I thought I was doing quite well in England, adapting by trying to cook in small portions and combining them all at the end when less heat is required. But cooking here I realise that there’s no substitute for having a high powered flame in the first place. I actually get “breath of a wok” that I first read about years ago but only got the merest whiff of on my English stove. The power is addictive. I think it’s not only being able to explode-fry or cook things extremely quickly that I’m missing back home, but also being able to regulate and maintain the heat properly. Here, once ingredients go in the temperature has to drop but gets back up so quickly it’s barely noticeable. Plus, what you get when you add water/shaoxing/soy sauce to quick stir-fried greens is such serious alchemy that it can’t really be compared with my previous pushing of soggy leaves around the pan to get them to wilt. I know it’s going to be tough to go back, so hopefully I can find a solution from all these great ideas! I am from Auscrown and we do still supply the HPA100LPB Rambo High Pressure Burner (49mj/hr) They are currently AUD$215 per unit which includes a 1.8m stainless steel high pressure hose and high pressure regulator. They are portable weighing at 7.5kg. Many people take this burner caravanning in Australia. We have another bigger burner, the HP200LPB which gives about 85 mj/hr, however it could be too big for residential use. As Carolin mentioned, the HPA100LPB is very powerful already. We have lots of other interesting and unique burners. We can use your international freight account such as DHL or FedEx or we can ship via Australia Post to Europe. Unfortunately all information on that website is in German though. I should also add that it is not cheap. Thanks very much for all these helpful suggestions! My experience with induction wasn’t great, and I’ve gone back to gas, which although comparatively puny, is at least kind of flexible. What I found ws that, when I’m using a wok, I have to do a lot of tipping and shaking, and moving around – even if of course I try not to take it off the gas. But with induction, there’s much less flexibility at all – any moment it’s not directly in contact with the metal, that’s it, no heat. So I found it was much harder to do the pan gymnastics that you could with gas, which provides a larger, more diffuse heat source. Of course, some inductions might be better than others? An interesting discussion as I’m looking to replace an old electric cooker with something suitable for Thai cooking. My suggestion would be the Garland range of gas cookers which a Chinese foody friend introduced me to many years ago. I had one of these at a previous house and miss it greatly – but I had hoped there might be something a little cheaper in domestic ranges since I only have room for a standard 60cm model. They are made by a Canadian company and distributed through commercial catering suppliers. They use a ‘Starfire-Pro’ gas burner which puts out up to 9.7kW, but can be turned down low enough to make a creme anglaise. The star shape of these burners is very good for getting the heat all over the bottom of the wok; there’s plenty of power and they are very controllable. various sizes. I’d add that they are rock solid and well made – as you’d expect from a commercial product. My friend has since moved on to a giant restaurant wok setup, which like some of the burners mentioned above is more powerful, but for domestic quantities I think the Garland is fine. You can pick up used 6-burner 90- or 110cm-wide models from commercial suppliers for around GBP 900 – unfortunately used 60cm 4-burner models are in short supply. If I could justify rebuilding the kitchen, I would to fit in one of their bigger range-size models which offer more space but since I can’t I’m looking for a 60cm 4-burner model. So it looks like I’m going to have to fork out for a new one – around GBP 1,900 I think. PS Just for comparison, the AusCrown wok burners are rated at 49, 55 and 64 MJ/hour, which equates to 13.6kW, 15.3kW and 17.8kW. The German Wok-it Wokbrenner WB 612 is rated at 11kW. The Garland is the lowest at 9.7kW. I doubt the difference between 9.7kW and 11kW is large in use and I suspect the figures aren’t that accurate – India Joze has some interesting comments http://www.indiajoze.com/faq.html. But on the face of it the Garland should have enough power for domestic use, and fits in easily. Having instigated this discussion a couple of years ago I just wanted to report that I’ve finally taken the plunge and bought a wok-burner/gas bottle combo. This was prompted by a recent moved to flat which only has an electric stove – an abomination but very common here in Germany! Fortunately this is balanced out by also having a patio where I can let the fire and smoke run free. So far it’s working really well, and installation was pretty easy, it just requires two spanners to tighten the cable onto the burner outlet. It has three separate controls, where the centre one controls the smaller middle ring, and the left and right control half each of the outer ring. This seemed like a rather odd setup at first, but there are benefits, such as when cooking something simple like tomato and egg, you can push the omelette to the heatless side to rest and leave the tomato simmering away on the other. So far I’ve been reluctant to go to full power, but last night I got the explode-fry ‘flame in the pan’ thing going on. Wind can be a problem in making the flame less than effective, so some kind of shield is needed, I think, by placing the burner inside some kind of high rimmed receptacle. The gas bottle itself I got from a local petrol station on a rent and refill basis. It was 52 Euro’s for the deposit and around 22 per refill. Hope this info is of use. Having used the setup for a couple of weeks I can say that I’d highly recommend it – I can finally cook quickly and efficiently as I’ve seen people do regularly in China! I stumbled across this post, and thought I might add my two cents. If you’ve got a turkey fryer, it might just do the trick. I’ve heard it on good authority that it does get roaring hot, but not owning one I’ve not tried this one out. Although… Graham Booth’s suggestion above is probably the way I’d go next once I have the cash! Glad I found this thread! I’m building a new house, and, wanting a good wok burner, have opted for the Highland wok burner (22 mJ – http://www.highland.com.au/products/cooktops/ht1ss-nl/) next to a 4 burner induction cooktop. Before I take the plunge – does anyone out there have any thoughts? Have an AusCrown HPA100LPB Rambo (49MJ/hr) for several years. Watching youtube videos of HongKong kitchens showed cooking times of 30-45 seconds. Rambo will do that on medium heat setting for a typical serve size. All ingredients need to be ready to throw in with intervals of seconds. It’s defintely fun and can deliver the restaurant flavour. High heat use useful for a big wok full of fried rice. Only problem is that the auto-lighter on mine stopped working. A stainless wok can be seasoned to a black patina at the right temperature.